On or about the 7th of February 1998, a small player-run town announced its opening with but 3 small houses. From these humble beginnings and through many trials and tribulations rose Lumaria, Baja’s oldest player-run city. Its members are dedicated role-players who have provided Lumaria with a culture and history all their own that is so rich in its detail that there is not enough space here to adequately describe it all. In addition to the known races of Britannia (predominantly human), Lumaria consists of two races which citizens are free to role-play…the Lumi and the Nahadrakeen. The Lumi are elf-like and strongly resemble the High Elves, who might be related to them in some way. The Nahadrakeen are a race of mountain dwarves. 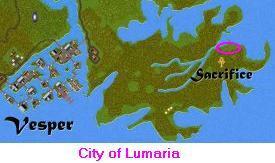 According to legend, the Lumarians once prospered in the grand city of Luminate. The location of Luminate is matter of much speculation, since few records exist. Some say that Luminate was built on far off Dagger Isle, others say that Vesper rose from the city’s ruins. In any case, a Nahadraken named Hawkwing, for reasons lost to history, hired soldiers from Lord Blackthorn’s Chaos Guard to invade Luminate. A bloody civil war between Lumi and Nahadrakeen ensued, and many of the Lumi people were sought out, hunted down, and killed. Hawkwing had an eye for Lumi women, and did later marry one by the name of Lealani. Lealani bore a son named Galen, although Hawkwing was not the father, and Galen became the founder of Lumaria. Galen was Lumaria’s first leader, carrying the title of Sara Ohm, and the town prospered under his rule. However, one day Galen vanished. A man named Samuel claimed that Galen was slain by Orcs and that he found the corpse. This would appear to be the case since Samuel had Galen’s keys and thus, access to all the town’s buildings. Samuel ransacked the town during the night, and soon after, Galen’s houses fell down due to lack of upkeep. ‘Twas a dark time for the town. However, Galen’s good friend Kvarno Goldeneye, along with several fellow Lumarians, stepped forward and established Lumaria’s first Town Council, restoring order to the town. The Nahadrakeen formed an offshoot city, Mordor, near Minoc. Today, Lumaria consists of approximately 15 public buildings, to include a multi-purpose tower that serves as a combination tavern, market, and town hall. The town has been blessed by the unnamed ones with a new bridge, taking the place of one created from boats which long provided easy access across the river. West Lumaria has recently sprouted on the opposite side of the river. Clearly, Lumaria is in a state of growth and prosperity. The role-playing I have seen in Lumaria is second to none. The Lumarians have a language all their own, much like Dark Elf Nation, and use it frequently. Their city is hospitable, friendly, and open to all, and the citizens there welcome role-playing and frequently do their own player run quests. If you are looking for a good place to role-play, or would just like to visit and enjoy their history, culture, and hospitality, than you can’t go too far wrong by visiting Lumaria, Town of Sacrifice.